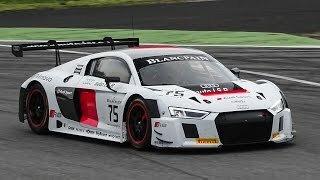 The first to enter was R8 LMS back in the year 2011 and it was just a few years after it that Audi unveiled its improved R8 LMS Ultra to enter the GT3 fray. Well here we are in the year 2015 and for the year Audi brings its all new Audi R8 LMS 2015, which is based on its R8 road car. We must say after looking at this all new unveil that Audi has undoubtedly presented a ferocious looking model, but what about the rest in it? Let us have a closer look to know more about it. Delivering fresh 250 Liters of air per second interior of Audi R8 LMS has been created keeping driver safety and comfort in mind. Adjustable steering wheel and pedal box are located right in front of the PS1 Audi Protection seat borrowed from R18 e-tron Quattro LMP1 car. Not only this to add more to the safety of endurance racer, a rescue opening roof has been molded. This roof will allow the rescue team to remove the helmet of driver and to an extent to bring him out of the steel roll cage fixed over the aluminum space frame, which isn’t just lighter but stronger in comparison to its ancestors. In all hearing from our perspective we found the interior of Audi R8 LMS 2015 a safety featuring comfortable section. 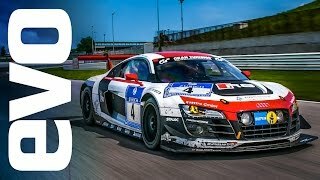 Exterior of Audi R8 LMS 2015 holds everything that will drag your likes and likes and likes to towards it, especially the war paint that makes this ferocious machine look more aggressive while on track. 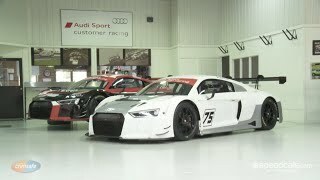 Exterior contributes commendably to lessening the weight of Audi R8 LMS, significantly the carbon-fiber-reinforced plastic body work which contributes around 55 LBS of weight reduction and thus bringing the total weight of Audi R8 LMS 2015 to 2,700 Pounds. To provide better airflow, wheel wells find their mouth to the wheels. While improvement in radiator air flow is also noticed through two protrusions and up-swept front canards which also assist in downforce. 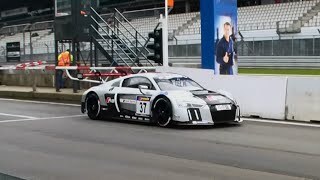 Audi R8 LMS 2015 gets it power through the 5.2 Liter V10 engine which we all know is derived from the road car version. For Audi R8 LMS its engine produces 585 HP with power to be transferred to rear wheels through 6-speed transmission with paddle shifters. New software with a powerful processor has been mounted inside to manage gearshifts and engine electronics with powerful speed.